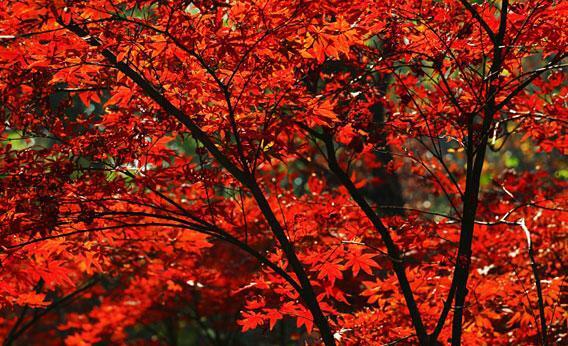 New England Fall Foliage: Why bright red leaves are in danger. Why the bright red leaves of New England are in danger. Almost 150 years later, New England boasts a worldwide reputation for spectacular autumnal colors. Beginning in late September, millions of “leaf peepers” from all over the world arrive en masse to zip along narrow roadways crisscrossing the region. In pursuit of the ephemeral “peak color,” these tourists consult detailed maps and calendars, load themselves into station wagons and tour buses, tote volumes like the 656-page “Book of Leaves,” fill up charming bed-and-breakfasts throughout the region, and traipse through dozens of foliage festivals and craft fairs. This year, tech-savvy peepers can download Leaf Peepr, a new foliage-tracking app from Yankee magazine, which also maintains the boosterish website YankeeFoliage.com. Those who can’t peep in person can consult one of dozens of webcams trained on a variety of vistas. I live in New Hampshire, and the gorgeous forests up here are more than grounds for provincial pride. They’re also a major financial engine. Foliage tourism is routinely estimated to bring well over $1 billion to the region each year. Tourism is the top industry in northern New England. In Vermont, the peak period of foliage season—the last week of September and first three weeks of October—draws the highest concentration of visitors of the year. The state tourism board estimates that tourists spent $332 million over the course of 3.6 million trips in 2009, the last year for which numbers are available. Maine draws 9 million fall tourists a year; New Hampshire, 8 million. First, our signature crisp fall air seems to be turning less, er, crispy. The Union of Concerned Scientists has found that northeast temperatures have been rising by about 0.5 degrees Fahrenheit per decade since 1970, with winter temperatures rising at a rate more than double that. The group says that regional temperatures could rise another three degrees within the next 30 years, and up to 12 degrees by 2099. This warming is already producing a constellation of region-specific effects, including a longer growing season and compromised sap production. Forest aesthetics are not immune. The New England Climate Coalition predicted a few years ago that if temperatures continue to climb unabated, “the fall foliage for which the region is famous will disappear as birch, maple, and spruce species migrate north or die out altogether.” New Hampshire’s Department of Environmental Services warned in 2008 that the state’s hardwood trees could move north by up to 300 miles. In Maine, scientists have enlisted citizens to document the effects of climate change by monitoring their own backyards. Not only will the current forests simply move north. The colors themselves could fade. The chemicals that create yellow, gold, and orange colors lie dormant within tree leaves all year long. In the spring and summer, the green color—chlorophyll—overwhelms them. Then in autumn, the greens fade in response to shortening days and the underlying colors become visible to the naked eye. Under most conditions, those yellows and pale oranges will emerge in the fall no matter what. The chemical that produces red leaves, anthocyanin, is different. That color must be produced each year by a precise, yet not fully understood, combination of sugar, temperature, and light. Scientists have found that those spectacular reds, so dependent on exterior forces, are particularly endangered by irregular weather. Three years ago, the University of Vermont Proctor Maple Center received a $45,000 grant from the Department of Agriculture to study how warming fall temperatures could also affect that signature bright red in maples. The team is currently conducting the project’s final round of experiments. Abby van den Berg, a research assistant professor working on the Maple Center project, explained that the team has found that crisp fall air is part of what makes maples red. “If cold tends to promote the red color,” she said, “it would be natural inference that if we had less cold temperatures during autumn, then that might impact the level of development.” Barrett Rock, a professor at the University of New Hampshire, uses spectral analysis on satellite photos of autumn forest cover. He’s found sugar levels in maples dropping, a phenomenon that is already leading to more muted reds. Bob Bower, a 61-year-old organic farmer in central New Hampshire, was out selling pumpkins, syrup, and homemade soap at the 64th annual foliage festival in Warner, N.H., on a recent weekend. “We’re boiling sap earlier and earlier,” he told me. “We’re growing vegetables later, and we haven’t had a hard frost yet. And it’s not just this year. It’s been consistent.” It was 80 degrees out as we talked, and the canopy of trees above us was green. Bower said it was the first year he could remember that the leaves hadn’t turned by the time of the festival. And he’s right: Several ongoing studies throughout the region are finding signs of fall occurring later and later in the calendar year. It would be more than a tourism loss to see the forests fade and retreat. Thoreau understood this back in 1862. “A village needs these innocent stimulants of bright and cheering prospects to keep off melancholy and superstition,” he wrote. “Show me two villages, one embowered in trees and blazing with all the glories of October, the other a merely trivial and treeless waste, or with only a single tree or two for suicides, and I shall be sure that in the latter will be found the most starved and bigoted religionists and the most desperate drinkers.” It’s not all that grim yet, but winter is on the horizon.